Thirteen is a lucky number for today’s advertisers. It’s the number of media channels that radio can effectively mobilize to execute a compelling cross-platform program. Radio today is much more than simply “radio.” Its cross-platform capabilities extend far beyond the traditional airwaves, targeting consumers via social media, online content, mobile, video, and other media channels. Each of the media outlined below can be expertly integrated into customized, strategic and effective cross-platform marketing programs by radio broadcasters for any advertiser. 1 – Broadcast Radio: This is the only mass medium that can deliver peerless targeting-in-time and nearness to purchase messaging. Broadcast radio reaches 93% of the U.S. population weekly, and more than 75% of people daily, with the average listener tuning in five days per week for nearly two hours per day. 2 – Personal/Professional Recommendation: Every day radio’s best salespeople — on-air personalities — “whisper” in listeners’ ears about the benefits of thousands of products. A recommendation from an on-air radio personality is word-of-mouth advertising at its best. No other medium has the ability to connect with the consumer on such a deep emotional level. 3 – Promotion: A creative on-air promotion, combined with flawless execution and radio’s massive on-air reach, can effectively enhance any on-air campaign. 4 – Sports Sponsorships: These sponsorship opportunities are an effective marketing vehicle on a number of different levels, including numerous grassroots opportunities to maximize the impact of a sponsorship far beyond on-air impressions. 5 – Streaming: Last month, approximately 103,000,000 people streamed online radio according to the 2012 Arbitron/Edison study. One broadcast app, iHeartRadio, has aggregated the broadcast streams of Clear Channel, Cumulus, Univision, Greater Media, Cox, Emmis, Salem, Federated and others, offering more than 2,000 AM/FM stations in addition to a customizable option. 6 – Personal Social Network Integration: Radio stations and personalities have embraced social networking platforms to complement their over-the-air connections, including Facebook and Twitter. According to a 2012 USC/Annenberg School of Communications study, 70% of listeners who mentioned they have a favorite radio personality “follow” them via social media. These relationships number in the millions, and can be accessed to greatly benefit any marketer. 7 – Internet Advertising: Many customizable options are available, including webisodes, personality pre-roll endorsements, display and rich media ads, as well as takeover pages. More than 20% of all U.S. radio listeners have visited a station Web site in the past month. 8 – Email Blasts: Station databases comprised of loyal, responsive listeners easily numbering in the millions across the country can be mobilized to supplement any on-air campaign. 9 – Mobile Ads: Rich media and display opportunities are a valuable feature in broadcaster apps to reach consumers while on the go. 10 – Event Sponsorships: Radio expertly executes large national events such as the Las Vegas iHeartRadio concerts, or smaller strategic, neighborhood events in every MSA across the U.S., providing advertisers with seamless integration opportunities. 11 – Experiential Brand Events: Radio creates customized events or seamlessly integrates products into existing station events enabling consumers to personally experience, touch or taste a marketer’s product. 12 – Product Samples: Experienced radio stations’ street teams are capable of professionally distributing, executing and–most importantly — promoting sampling events for maximum impact. 13 – Podcasting: 36 million Americans have downloaded a podcast in the past month per the 2012 ARB/Edison Infinite Dial study. Videos and other locally produced online content are also available for integration/sponsorship. Radio’s ability to provide compelling and customized cross-platform solutions is without equal. When evaluating various media alternatives in the channel planning process, it’s important to consider each medium’s ability to activate additional media channels in a seamless, effective manner to achieve a true understanding of each medium’s overall “value.” Whether it’s on-air, online, on demand or on-site, radio can effectively execute strategic marketing solutions that consistently deliver the “goods” and go far beyond 30-second and 60-second ads. 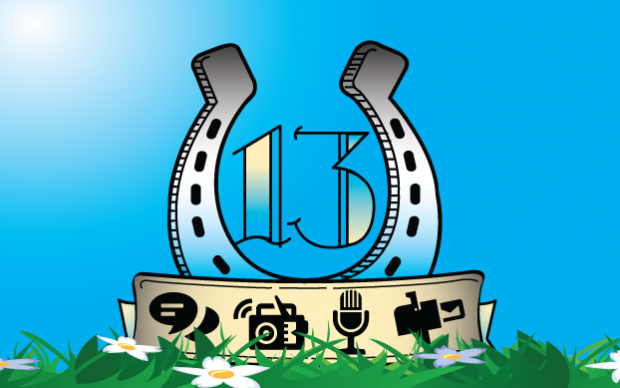 Thirteen can be an advertiser’s lucky number.